Schools and government offices on the Blackfeet Reservation were closed again Tuesday after another bout of winds buffeted the reservation, leaving roadways impassable, buried under snow drifts. The reservation remains under a state of emergency and an Incident Command team is coordinating with the State of Montana, the Bureau of Indian Affairs, the Federal Emergency Management Agency and other state, tribal and non-government groups. Montana Department of Transportation crews clear roads north of Browning, MT on S-464, February 26, 2018. The Incident Command team has asked people to obey road closures and give snow clearing crews space to work. Reverend Calvin Hill of the Blackfeet United Methodist Parish in Browning says a handful of stranded travelers have been staying at the church, which opened an emergency shelter with the American Red Cross last week. "We also are doing daily feeds. Breakfast, if people need it; dinner, if people need it; and lunch, if people need it. Then with the first responders we've got that meal box that we send out, and as much firewood as the first responders can take with them." Many homes on the reservation rely on wood-burning stoves and firewood is in demand. Some residents in Heart Butte were without water for a few hours Tuesday after a fire hydrant started leaking. People across the reservation are relying on Facebook for updates about road openings and closures, when resources are available and to hear from tribal authorities. Find updates from the Blackfeet Nation-Blackfeet Tribal Business Council here. 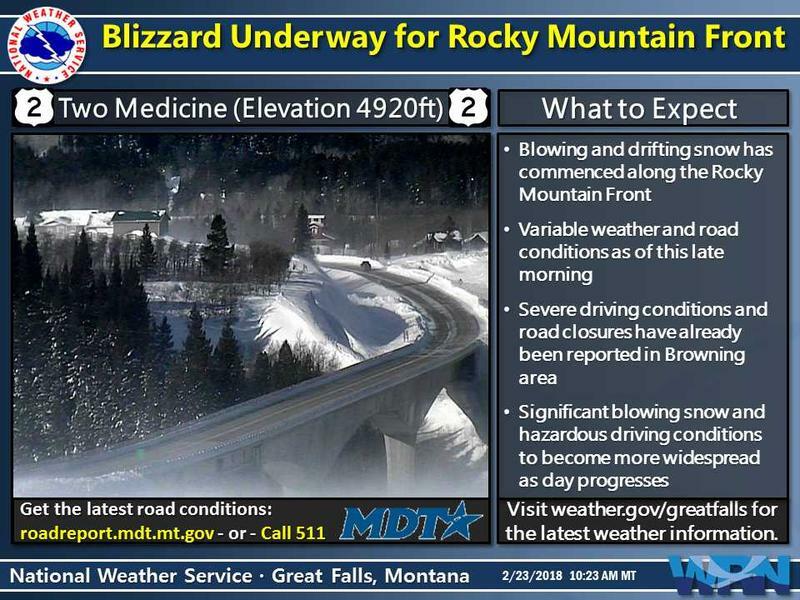 The National Weather Service has issued a blizzard warning for the Rocky Mountain Front through midnight. Wind gusts of 55 miles per hour could cause whiteout conditions. Significant drifting and an additional 2 to 6 inches of snow are expected. The United Methodist Church, Tribal Fish and Game and Nourish the Flathead are accepting donations of food, firewood, supplies, cash or volunteer time. More than two weeks of blizzard conditions in Montana’s northern tribal nations pushed Governor Steve Bullock to sign an executive order today declaring a state of emergency. This frees up equipment and funds, and extend hours for fuel delivery to help the Blackfeet, Fort Belknap and Northern Cheyenne Reservations, as well as Glacier and Golden Valley Counties. 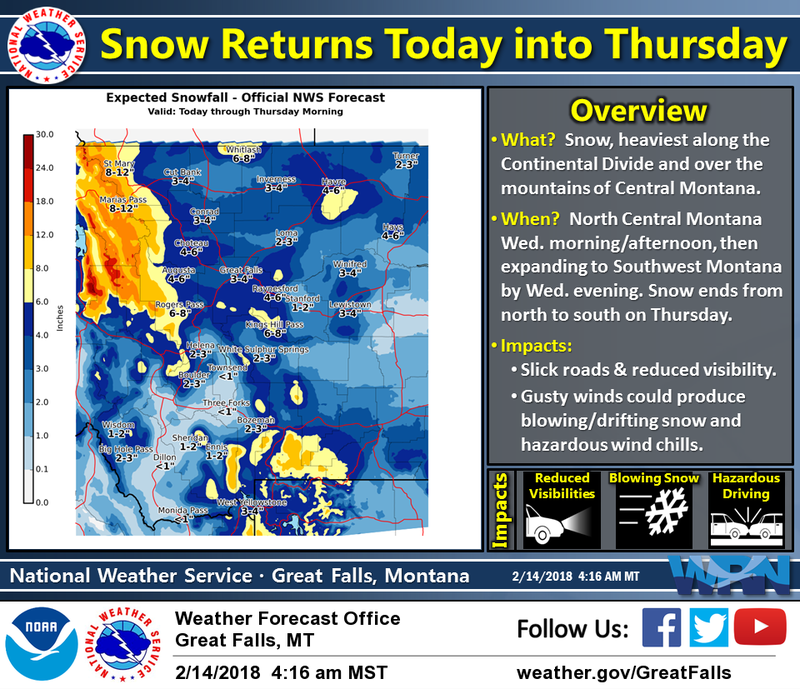 Bullock’s emergency declaration is retroactive to February 14, due to the extreme cold and drifting snow in northwestern and southeastern Montana. 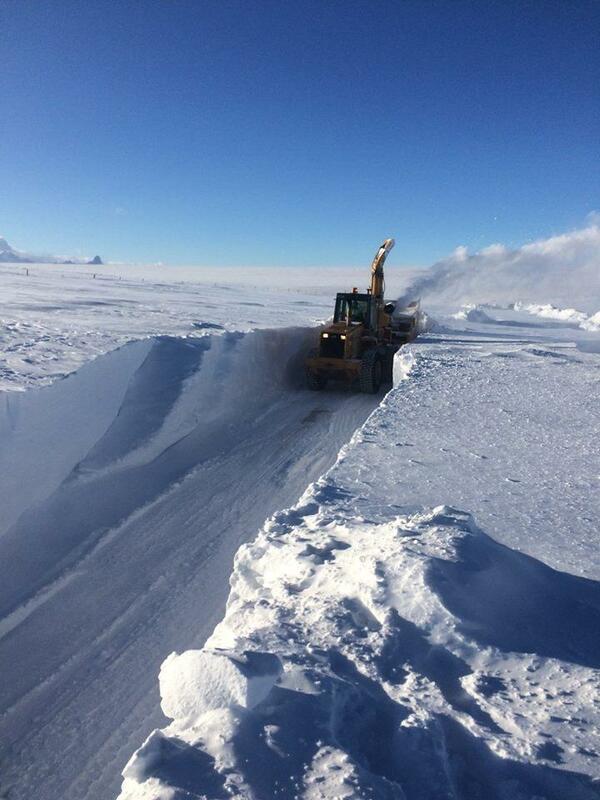 Robert DesRosier, Incident Commander for the Blackfeet Nation, says the reservation is on its 16th day of blizzard weather, with houses buried in 20-foot drifts of snow. "We’ve been ordering up some more extra resources. We’ve got loaders and graders and snow blowers and snow plows coming from every direction. So, we’ve been very thankful for that. The snow amounts are just phenomenal. This is going to be a winter we talk about for quite some time." DesRosier says the Blackfeet declared its own state of emergency January 4. For Information regarding donations to the Blackfeet Tribe, contact Fish and Wildlife Director Donna Rutherford at donar@blackfeetnation.com. To make a donation to the United Methodist Church, which is using its operations budget to cover the costs of the emergency shelter and firewood, visit www.bumpmission.com. To organize a volunteer shift or donate supplies, contact Pastor Dawn Skerritt, who’s running the incident commander at the Columbia Falls United Methodist Church, 406-260-5562. 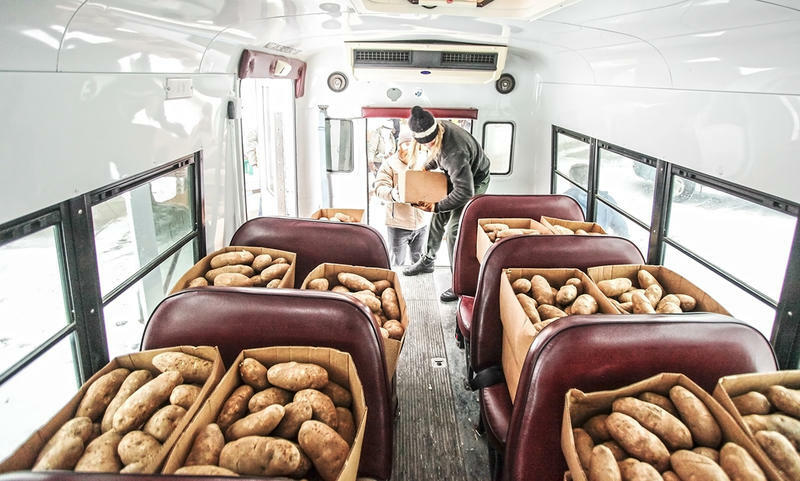 To donate to the Blackfeet Nourish Project, which is organizing food drops from the Flathead Valley, visit: http://nourishtheflathead.org/donate/. National Weather Service, Great Falls, MT. 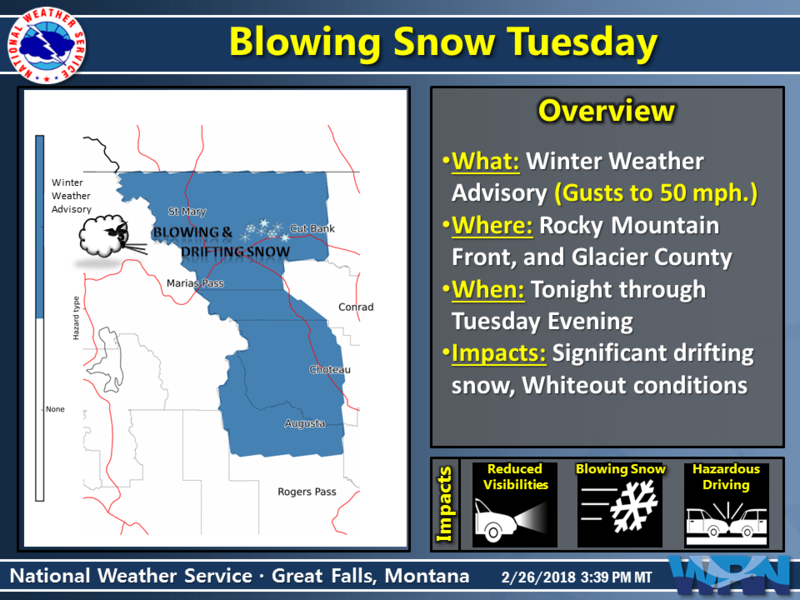 The Blackfeet Reservation remains under a state of emergency as yet another blizzard bears down on the Rocky Mountain Front tonight into tomorrow. The series of storms have forced Heart Butte Public Schools to close 10 times since the start of the year. Blackfeet Nation Disaster and Emergency Services is advising people to stay off roadways during a blizzard that’s hit the reservation carrying what’s described as “hurricane force winds” and white-out conditions. Several major roadways, including Highway 89 north and south of Browning, are closed due to poor visibility and wind-blown snow drifts. U.S. Highway 2 is open but experiencing severe driving conditions. Conditions are expected to worsen tonight. A prolonged winter storm has closed roads, schools and tribal offices on the Blackfeet Reservation. Five feet of wind-drifted snow buried roads in some places, preventing plows from reaching outlier communities like Heart Butte. Some people have been stranded since the weekend after a blizzard moved through the eastern Rocky Mountain front last week.